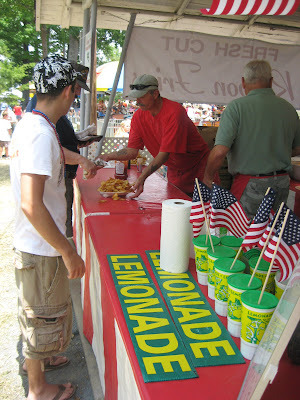 As many years as I have lived in this area, I've never made it out to the Faith, North Carolina 4th of July festival. It's a week long event kind of like a county fair and with entertainment, contests (like the Apple Ugly eating contest), Faith Idol singing, and fireworks to wrap the week. 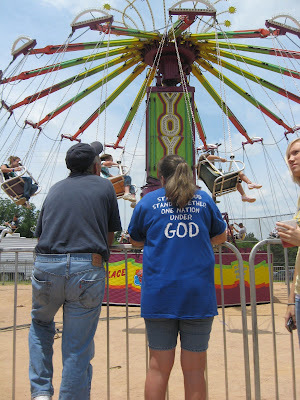 I'll probably crank up the grill later tonight, but the Faith NC Festival had plenty of good grilled good. There were loads of hot dogs and hamburgers at different booths. I would have to recommend this delicious grilled corn too. For the young ladies, I might add that the grill chef is a cutie as well. Just in case you didn't notice - which you probably did. 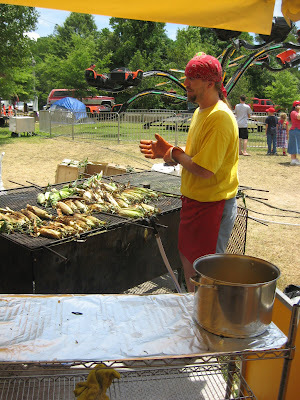 If you want to make your own grilled corn on the cob, then check out my grilled corn recipes at Yes You Can Grill. It really is easy to make. The curly fries also looked great. I try to stay away from those, since the doc said to watch that fried food. But, yum, those are good. That's one of those things you save up for as a treat when you have high cholesterol. 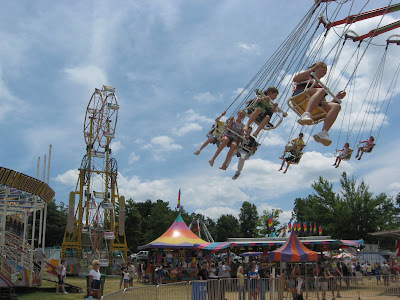 I was thinking not to get on the swings after eating carnival food. I learned that early on. I also learned not to get cotton candy before visiting the cow barn, although Faith does not have a cow barn at the 4th of July festival. They did, however, have cotton candy. 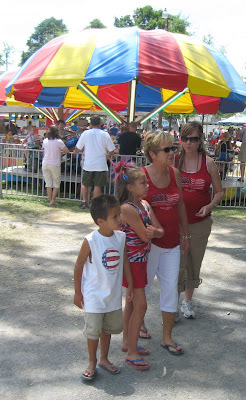 Faith, NC puts on the biggest 4th of July party I know of, and I'm glad I went this year. I'll have to put that on the calendar, and since it's the week of the 4th, it ought to be easy enough to remember. They were having a good time down there, and it's only about 1/2 hour from my house. Heck. I wouldn't even need to crank up the grill. I could just go back later and get dinner too. Happy 4th of July to all my readers (thanks) and to the good folks in Faith, NC who certainly were friendly and were very patriotic too for the 4th. Sounds like you are having a great 4th. Like always I am the only one on my block that BBQs or even thinks about grilling. Anyway, best to you and your family! I enjoyed the pics. Glad you had a good 4th. That does sound like fun. 4th of July in Faith. It is a great event, I have been going for 20 years now.